Donut Wedding Displays - The Hottest New Wedding Trend! Donut Wedding Displays – The Hottest New Wedding Trend! We are very familiar with seeing the much loved candy carts in weddings, and have really enjoyed the way couples can really make it their own and tie it into the theme of their wedding. Now however a new fad (or will it become a Trend?) is taking off in around the world. The mouth watering donut wedding displays. We have already seen how doughnuts have become a new food trend all over the world – so why not stack them up and make them a feature on your wedding day. 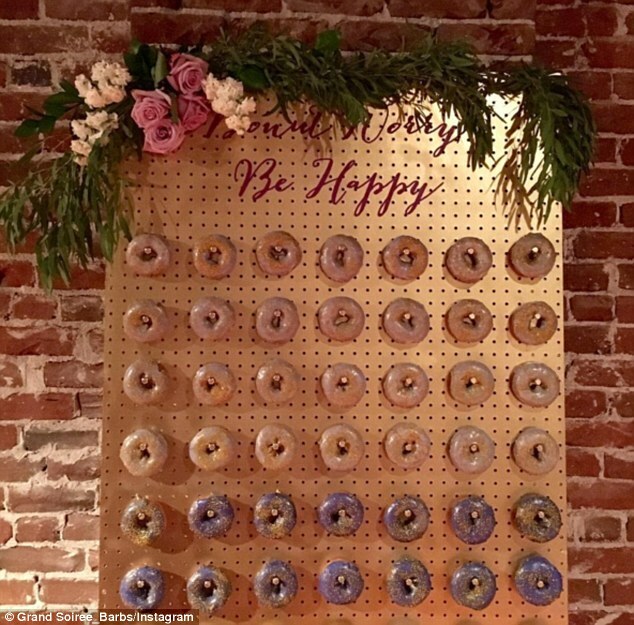 Now that you are engaged and in the process of planning your wedding, a donut wall is an interesting way to grab the attention of your guests. Chances are your guests will not have seen a doughnut wall before, so this is really set to wow. Not only can guests tuck in and choose a ‘Hole’ lotta Love, they can also pose for pics in front of it – therefore it has now doubled up as a decorative piece and your photo wall backdrop! Imagine giving your guests the option of eating doughnuts! Donut wedding displays have become more and more popular recently. You could probably still find trays of cupcakes at weddings from time to time but the latest trend is the donut wedding display. If you are an Instagram user, you will probably have seen pictures of donut walls among other donut displays. If this is something you’d like to consider for your wedding, you can get some great ideas from Instagram. Donut walls can easily fit into any theme you may choose for your wedding. Think of the endless display possibilities! When looking for reception ideas, don’t forget to add this to the list! I look forward to seeing couples put their own spin on the Donut Wall.